"Body Armor was the most controversial." Treyarch has outlined some of the lessons it learned from the Call of Duty: Black Ops 4 beta, and detailed the changes it'll make ahead of the next beta trial scheduled for September 10 on PlayStation 4. Summarising the recap in a Reddit thread, Treyarch said that while it wouldn't "go into detail on every fix or tuning change [they]'re making", it would comment upon "the most-discussed topics that also intersect with the game’s design intent". Interestingly, the post spent a lot of time dissecting Black Ops 4's much maligned body armour. 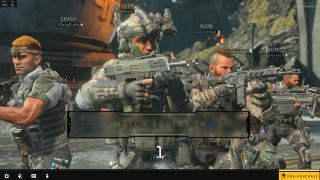 "In service to the overarching goal of increasing gameplay depth, we introduced the Gear category to Create-a-Class in Black Ops 4," the post said, before stating "the balance for this category wasn’t quite dialed in for the beta" and acknowledging the Body Armor "was the most controversial" issue to have come out of the beta test. Going forward, Treyarch intends to ensure explosives will correctly shred armour, damage is reduced if you have it equipped rather than "completely deflecting it", and adding a 25+ bonus to players who successfully take down an opponent sporting it. However, Treyarch added that while "annoying", the issue wasn't quite as troublesome as some players made it out to be. As player feedback "made it feel a lot worse than it actually was", don't expect it to disappear anytime soon. "It's really important that we see the full range of Create-a-Class content in play with a lot of data about player performance with this content before we rush into any changes with it," the post said, "let’s give this one a few more days to breathe." Other changes scheduled include tweaks to Fog of War and minimap awareness, improvements to tac-deploy and spawning, loadout in killcams, free cursor UI navigation improvements, and all players that hit the unexpected progress wall at level 34 last time around can expect to receive a permanent unlock token. "Game development is fluid—we know to expect the unexpected, and we’ll always work to solve problems quickly as the game evolves," the post concluded. While the next PC beta test has not yet been dated, assuming the schedule follows the same pattern as the first public beta, we hope to see it on PC the following weekend. Here's hoping Treyarch confirm it sooner rather than later; as always, we'll keep you posted.